Teeth are essential part of our body, which is always given priority when we are suffering from dental pain.So; instead of being discomfort education regarding proper hygiene is necessary. Most people used to brush teeth for maintaining fresh breath basically the main purpose is to avoid plaque as well as tartar. Teeth’s brushing is a vital activity which can easily maintain healthy teeth. The most important objective in the context of oral hygiene is the removal of plaque from our teeth. A poor hygienic condition leads to many harmful diseases. Patients having Periodontitis or any gum disease has to face increased risk regarding diabetes and cardiovascular problems. Having poor dental hygiene and a periodontal disease can cause lung diseases like pneumonia and chronic obstructive pulmonary disease (COPD) as well as increased risk of osteoporosis or osteopenia. For a good oral dental health, one should take care in many areas as: Routine of daily dental cleaning, limiting the snacks with a balanced diet, avoiding tobacco products like smoking, daily mouth examination. Brushing teeth twice a day from front as well as back provides relief from gum diseases. One should learn how to floss the teeth, after taking food rinsing the mouth properly is highly recommended. Always keeping the mouth moist using fluorides will help to avoid plaque and tartar. Always try to have fresh juices and some nutritious foods. Ferment able carbohydrates and other free sugars always add risk and prevalence of tooth decaying. Always try to avoid soft drinks as fruit juices are much more erosive as in comparison to the whole fruit. 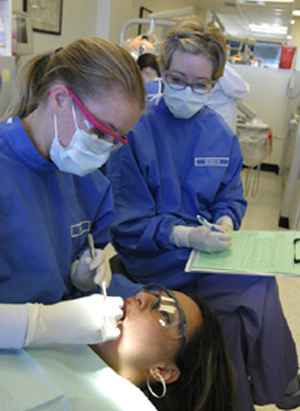 Oral dental hygiene has a vital role in life of human that generate confidence and quality in life. Routine dental cleaning and a proper diet always reduce any flaws in teeth. According to some recent study, a special chewing gum may help in teeth strengthening. Furthermore, strong teeth whitening treatments cannot leave teeth whiter for a long time. A complete periodontal treatment helps to prevent diabetes. Root planning and scaling are the most common periodontal treatment. It involves the smoothing of roots so that bacteria cannot easily grow and reproduce. he says that his gum bleed even if he eat something like apple. Will this work as good as what dentists use in their office?